♦Work on Home electrical distribution or lighting equipment should only be conducted by a qualified electrician. When you are buying, selling or remodeling a home, have it inspected by a professional electrician. 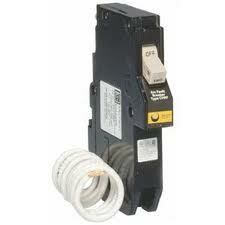 Arc Fault Breaker, Shuts off electricity when a dangerous situation occurs. ♦Arc fault circuit interrupters (AFCIs) are a type of circuit breaker that shuts off electricity when a dangerous condition occurs. Consider having them installed in your home.